Navigate the ins and out of start dates and due dates, and learn how to remap them from templates! Start dates and due dates allow you to create a clear timeframe for tasks to be commenced and completed. These features are both ClickApps, which means they are enabled at the Space level. Turn on the ClickApp "Dates"
Note: If you plan on adding due dates for subtasks, you can opt to check the box stating Ask to remap subtask due dates . This will allow you to preserve the relative position of your subtask due dates when you create tasks from a template. Click on the calendar shown in the "Start Date" and "Due Date" columns to add dates to tasks. 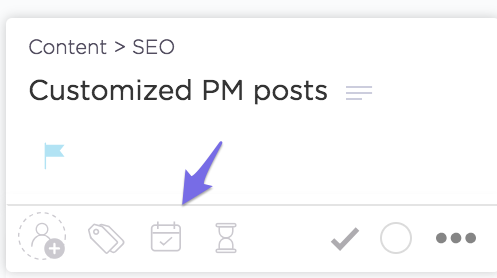 Make sure you've enabled these columns by clicking on the ellipses ... above your tasks and selecting them from the dropdown menu. Hover over a task in Board View and click on the calendar icon to add dates. 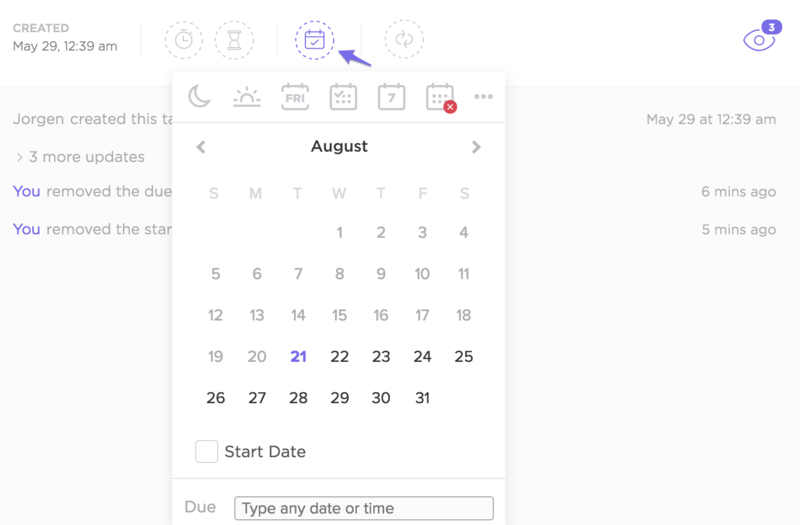 Click on the calendar icon on the upper right side of your task to add start and due dates. Note that when adding a start or due date, you can also specify a time! For example, just type in "Today at 5 pm" to set a time-specific start or due date. ClickUp offers a variety of template options so you can reuse your favorite Spaces, Projects, Lists, tasks, and checklists in an instant. However, what if you have due dates in your template that need to change when you create an item from the template? That's where remapping comes in handy. Basically, remapping allows you to preserve the relative position of due dates in your tasks, without having to manually update them all. Check out this doc to learn more!